When a New Zealand employer trialled a four-day week, the result was an 'unmitigated success'. The trial has attracted a huge amount of interest around the world, with an audience of 3.2 billion people in 32 countries engaging with the idea via 10,000 social media posts and 3,000 news articles, according to the firm’s founder Andrew Barnes. The company expects the bulk of its staff to choose to work a four-day week. But it is still an option, with Barnes stressing that flexibility is key. Staff will be able to come into the office and work normal hours for five hours, if that is their preference. Others will be able to start or finish early to avoid traffic congestion and manage their childcare commitments, while others could opt for compressed hours. The trial was measured by Jarrod Haar, professor of human resource management at Auckland University of Technology. He found job and life satisfaction increased on all levels, both at home and at work, with employees performing better and enjoying their jobs more than before the experiment began. Those findings were exactly as Barnes had predicted. Indeed he says the decision to test the new way of working was “the right thing to do”, after looking at several global productivity reports. “This is a bit of a crusade for me now. I think it’s important to change how we work but I also want to identify all the social benefits that come with changing our thought processes about our work patterns,” he says. 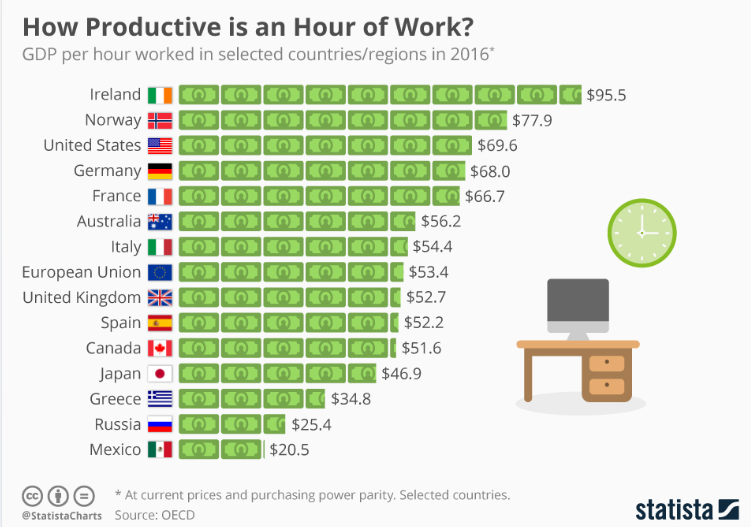 South Korea, for example, ranks near to the bottom of OECD countries for labor productivity despite having a culture of working very long hours. Similarly, within Europe, Greece has one of the longest working weeks, but comes out bottom in the OECD’s measure of GDP per hour worked. Not all the hours worked contribute the same to GDP. One thing is certain, this is just the start of the conversation. And many policymakers and companies will continue to reflect on the results of Perpetual Guardian’s experiment and examine how to both increase productivity and improve work-life balance.